One of those situations where you make the most with what you've got. Never been to Bombo before, probably won't get the chance to return. Woke up early, drove 30 mins in the dark, walked through some scrub in the dark, set up the tripod and camera in the dark on a sloped rock next to the channel, stuck an ND filter on, manually focused and hoped the clear sky didn't blow out the image. Well, the sky did blow out (even with stacked filters), the swell was flat and the sun was concealed by featureless cloud in an otherwise annoyingly clear sky. Not much went the way I'd hoped. A few days later going through the 40 or so captures, it turns out the first one was the best one. Working in the dark in a difficult spot, being able to set up the User Defined dial functions the night before makes a world of difference, eh? Excellent capture jawsy...the low cloud line keeps the attention on those rocks very nicely. Good shot. 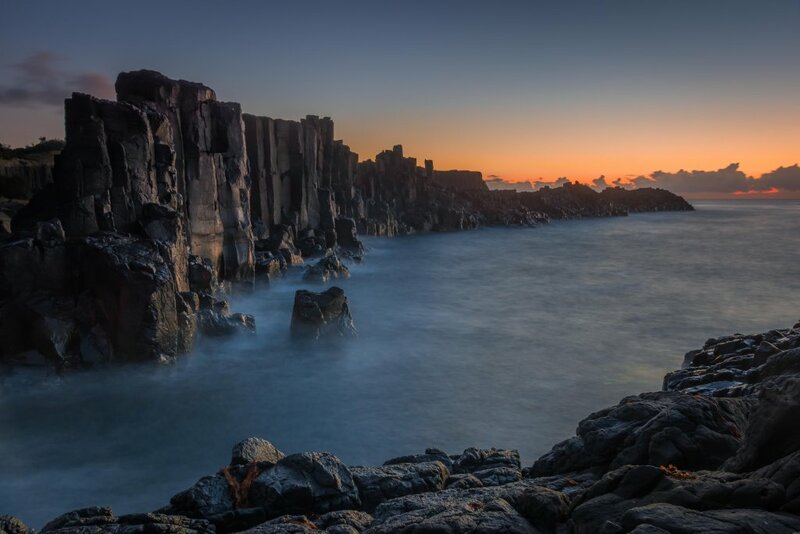 Never heard of Bombo Quarry before. It obviously has great potential but you had to work for it! I like the image. Half the fun of getting an image is putting in the effort in the hope that everything comes together. It rarely does, but without your desire you would have nothing. I first heard of Bombo when I worked in the railways; Bombo dust was a term used to describe fine crushed ballast used in the far central west wheat lines and Bombo supplied ballast for track works (still does I think from the quarry slightly further inland). This particular section is now preserved for geological reasons. I hadn't heard of this bit until my next door neighbor showed me a photo he took on a holiday. It's an interesting spot, but if you're going in dark, be organised and take a Maglight.